SafeGuard Heating & Plumbing Services - Central Heating Engineer, Plumber based in Gedling, Nottinghamshire. 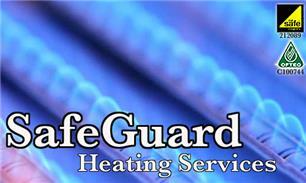 Hello and welcome to SafeGuard Heating Services. We are Gas-safe and OFTEC registered boiler specialists and heating engineers based in Nottingham. We specialise in providing a fast and friendly service on boilers and central heating systems. With over 25 years experience we can provide the knowledge and practical skills needed to help. Whatever you require. If your boiler needs a service to keep it running at it’s best performance, or it’s stopped working and it needs diagnostic repair. We’re here to help. With access to thousands of spares, we’ll have your boiler back up and running as soon as possible. If you need a new boiler as a replacement for your old inefficient one. We’ve got the right one for you. With a choice of manufacturers and models available, we can supply a boiler to suit every need and budget, and with 5, 7 and 10 year manufacturer warranties available so you’ll have the peace of mind knowing you won’t need to worry about repair bills for years!